This year’s World Health Day theme hits close to home as I have experienced first-hand how to undergo financial hardship when my precious seven-year-old niece, Rianna got sick and died, leaving us with a huge financial debt. World Health Day calls on world leaders to take concrete steps to move towards universal health coverage (UHC), ensuring that everyone, everywhere can access quality health services without having to undergo financial hardship. I detailed in my previous post, Life Without Rianna how we lost her to devastating and debilitating illnesses: encephalitis-pneumonia-ovarian cyst teratoma. And this entry will tell you the reality when you get sick in the Philippines. At least based in our experience. Her 10-month confinement costed us a whooping P13 million (US $250,250) hospital bill all in all. Rianna was rushed to a premier hospital due to her critical condition. When she arrived at the emergency room, she immediately experienced seizures so she was brought to the Intensive Care Unit and stayed there for four months, which is more expensive than regular rooms. Every month, the hospital was charging us more than P1 million (US $ 19,250) for her confinement, medications, and tests, excluding our personal expenses, her medical supplies and medicines which my father opted to buy outside later on because it’s more cheaper and to lessen our hospital expenses. We were becoming restless as our bills began piling up. How in the world are we going to pay for it? My sister, Rianna’s mom was jobless because she had to devote her time 24/7 taking care of my niece. We didn’t employ a Private Duty Nurse (PDN) because that would cost us another P13,000 (US $288) every month. My other sister and I had regular jobs, but our combined incomes still won’t be enough to pay the bills as well. While my parents were retirees, that shouldn’t be their responsibility in the first place and they don’t have enough money as well. But let me tell you the truth: Rianna had an estranged father who was supposedly shouldering all the responsibilities and expenses and taking the lead role and we were just supposed to be there as back-ups or support. But that didn’t happen. We took the lead role, and he just came in whenever he pleased. While he let the hospital charge Rianna’s bills to his insurance card, he and his family refused to help pay in cash when his card was maxed out later on, insisting that we should be the ones paying as we were the ones to blame for Rianna’s sickness. So we had no choice but to find an alternative. My father (Rianna’s grandfather) went to charitable institutions such as Philippine Charity Sweepstakes Office, Department of Social Welfare and Development, Philippine Amusement and Gaming Corporation, Caritas Manila, GMA 7’s Kapwa Ko Mahal Ko, ABS-CBN’s Lingkod Kapamilya Foundation, but despite all the guarantee letters they issued, the hospital still won’t allow Rianna’s discharge unless we pay in cash. Good thing we had good and close friends who launched a series of fundraising campaigns to help us pay our hospital debts. They organized two Concerts for Cause, distributed Coin Bank for A Cause, and did Zumba for a Cause all for Rianna. Thank God those campaigns had been very successful because they were very well supported by our families, relatives, workmates, classmates, and friends from church (some of them I haven’t even met in person like Ipuna Black), and neighbors who bought tickets and also donated cash to help us. After that, we also launched our own fundraising campaigns via Facebook seeking financial help. While at first, it was too embarrassing for me to beg, I had no choice but to go for it just to survive our dear Rianna. Despite our efforts to pay a portion of our debt and issue a Promisory Note, the hospital still demanded for my parent’s land title, to which I really broke down in tears. Giving them our land title could mean our house could be taken away from us if we fail to pay our debts. And it’s not just a house, it’s our parents’ home built over the years through their sweat, blood, and tears. It’s our home. At a point when we were almost ready to give up, a lawyer from the Public Attorney’s Office intervened for us and he was able to secure a Court Order, ordering the hospital to release Rianna and honor the Promisory Note or else, they shall face the consequences. Republic Act No. 9439 prohibits the detention of patients in hospitals and medical clinics on the grounds of non-payment of hospital bills or medical expenses. The hospital gave in and finally allowed Rianna’s discharge. I was so elated. We were so relived and overjoyed. We immediately brought Rianna home so she can continue her recovery and medications there under our care. However, our expenses didn’t end at the hospital. 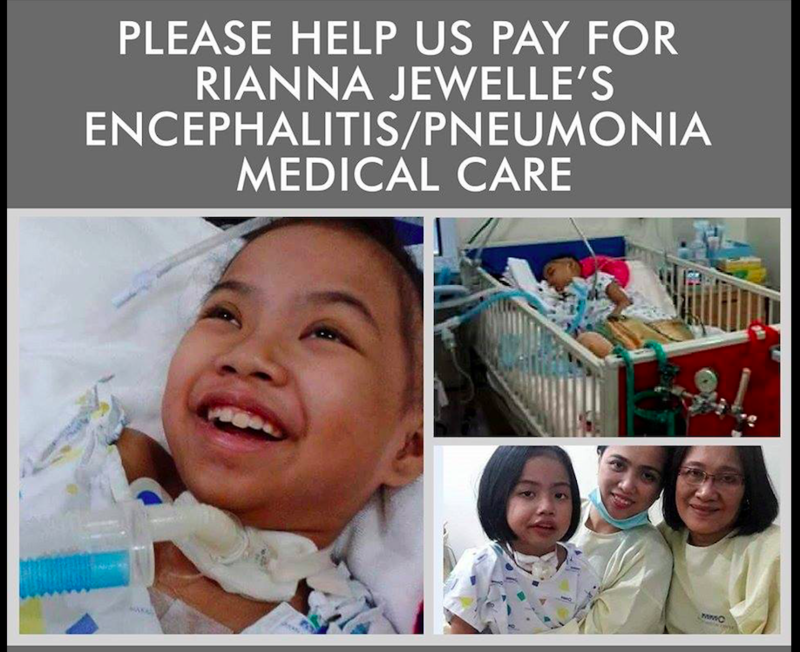 At home, we were spending more than P30,000 (US $577) for Rianna every single month to buy her supplies, medicines, doctor’s check-ups, air-conditioned room (due to her pneumonia), and weekly physical/occupational therapies, and other maintenance. When she eventually joined our Creator last August 12, 2017, we were devastated because we were not expecting it. No one’s expecting it. It’s not part of our plan, because we were positive, we were hopeful that she will eventually go back to normal. We did everything to support her and extend her life. But God has other plans. It still hurts up to now, but I would like to believe He has other plans and they are for the better. It was financially draining to take care of a very sick patient, especially on the part of my parents, who had to shoulder all the finances, stress, and responsibilities. But they never regretted it. Not once I heard my father complained. Nor my mother. My parents gave their all to Rianna. Rianna’s mom gave her all. We gave our all to Rianna. But I can understand why some families and/or relatives would chose to give up their loved ones who were already bedridden, or dying with lingering illnesses because they cannot afford anymore to spend for his/her long-term medications or care. But while we were struggling, I can honestly tell you that God really provided for our ALL needs during those difficult times. In fact, when we felt so low, I could feel his presence, his help through people or any other means as an assurance that He’s just there and will never leave us. God never left us. He was there all the way. And from that experience, we learned so many things, especially how hard it was beg just to survive a sick kid, and how it felt to get rejected as well because not all people were generous. But maybe they were undergoing their own personal struggles and crosses as well, and we completely understood that. However, we will never won’t forget those people who were there for us, who never left us, who sacrificed their own personal, hard-earned money to help us. We may not be able to pay them back, rest assured we will pay forward. I am crossing my fingers that this shall be passed into law soon and be strictly implemented, because if it happened to us, it can happen to anyone much worse than what we experienced and this will benefit people who really have nothing and who have no one to turn to. It’s hard enough to be sick, what more if you have no means to get well or pay for it. As one good doctor puts it: Poverty and poor health is not a good combination. But despite so many health and political issues and tragedies that are hounding our country, I still have high hopes that someday, our country will get better in terms of providing healthcare, and will really choose no one whether he’s rich or poor. I really do hope that someday. To my precious niece, Rianna, please know you are my inspiration. We love you and we miss you every day. Jothish Joseph; Are you healthy? Mylene, that is just awful, what you lived through. I am glad you had the strength and I’m glad Rianna had loving people around her who truly cared about her and fought hard for her and her medical care. I didn’t know you were in distress or I would’ve sent something even though I don’t have much. My mother would’ve, too…I’m sorry I didn’t know, as I would’ve gladly given you any support I could’ve, in any way I could’ve. I agree with you that Rianna is in good hands where she is now. I wish she were still with you all, and healed fully, though, because she looks like she was a delightful child and I know you and your family loved her with all your hearts. Many blessings for you and your family, Mylene. Thanks for this, Barb. No it’s okay. Support comes in any form and by just knowing that someone is empathising with me is more than enough. How’s your mom? I pray that everything will go well for her. Mom’s doing all right, for the most part. She’d feel much better if she were at home, but right now that’s just not possible. I witnessed my mother care for my stepdad that passed away this January. It was a very expensive task ate into most of their retirement because insurance didn’t cover a lot. Then, they had to switch to a very expensive insurance that took more of their retirement funds. The entire process of selfless service to someone sick was draining, all the way up until his death. My mother is still recovering from cycles of grief, to also picking herself up after getting hit financially. Getting sick is an arduous situation on so many levels, it hits emotion, finances, and can affect us physically. It’s hard on the caregivers and those who are suffering. Thank you for sharing the story about your mom. Yeah, it’s really hard to take care of a sick patient. How’s your mom coping now? It’s been three months and I know it’s hard for her. It’s sad to know that there are really issues on healthcare everywhere in the world. Not just in my country. We can only hope things will get better in the future. Thanks for reading Sonyo! Oh no! I’m so sorry to hear the loss of Rianna and how you’ll had to go through such a tough time to pay the hospital bills. The begging part and Rianna’s loss made me emotional. I somehow feel medical treatment and healthcare is a basic need which should be affordable yet it’s kept as the most expensive one. Glad to know that atleast you have family and friends who supported you and helped you lanch fundraising campaigns. Mylene, you are such a strong woman and a motivator to many. Take good care. Thank you Sadaf. I still cry whenever I talk about Rianna but I guess it’s part of the healing process. I need to talk about it and get this off my chest. Thanks for reading and commenting. Looking forward to your post. I am so sorry, Mylene. We have paid a lot out of pocket for Jy’s care. Insurance doesn’t cover everything. Rehab is very expensive. Holistic care isn’t covered at all. It’s unfortunate that medicine is so expensive. I’m sorry that the hospital wouldn’t discharge Rianna! I didn’t know that was legal. May God continue to bless you and your family. It’s sad to hear that poor healthcare happens everywhere in the world where it should be one the main priorities of the government. I will always remember how you extended a helping hand to our family and share your stories and struggles about Jy. It reminds me I’m not the only one who is going through a lot. Jy is always in my prayers, Ipuna. Recovery takes time but I know he’ll get there. May God bless you and your family as well. Awe, you are the sweetest. I will take all the prayers I can get with Jy! He is fighting an uphill battle with the encephalitis. Writing has been his hardest challenge. He is about 2 years behind with writing and spelling, but we are going to get him caught up by the grace of God! 🙂 I’m so happy to share this journey with you. It broke my heart when Rianna passed away. She’s a little angel now. It’s never easy when a loved one leaves us. I literally don’t know what to say. It’s been really saddening to hear about this tough time you had. You have taught me today that we keep complaining about all sorts of things in life but actually those complaints are totally irrelevant when we see other people. You are really blessed to have so many well wishers who are always willing to lend their help. My respect for your immense courage has grown further. Power to you and your family! May Rianna’s soul ready in peace. Thank you Jothish and welcome back to the collab. Always feels good to hear comforting words from people, especially those I have met personally. Yes, I always look at the positive side of the situation. I believe that everything happens for a purpose. Looking forward to read your future stories. Thank you Gel. I’m happy to finally hear from you. I know this topic/theme is close to our hearts, especially now that you are undergoing some challenges in your family. Please know that you have my prayers and I am just text/FB away if you need anything. Thank you for listening to me and understanding me during those times and why I had to leave. I always tell people that you never changed. You are still that humble, kind, and respectful person I met. Keep it up! And again, welcome to the group. Looking forward to our next collab! I’m sorry that the hospital wouldn’t discharge Rianna. It’s truly sad to hear of all you went through during that time. But I am glad for one thing… Y’all came out stronger (in faith and in body), wiser and holding on all the more to God Almighty. Thank you for the kind words, Jane. May God bless you too. Thank you for this Nicolle. It is easier to tell the story as time goes by, but it hurts still. I know I’ll get through this as well.